Notice anything new along Mass Avenue during your commute this morning? How about 18 new things? This past Saturday morning, 20 Citizen Foresters and 55 volunteers from St. Matthews, Dartmouth Club of Washington, DC and several Latin American Embassies donned mesh vests and planted - Chinese Elms, Hollies, Overcup Oaks, Serviceberries, Gingkos (not to fear, they are certified males), Yoshino Cherries, and Red Maples. Oh my, that is a lot of future tree canopy planted in short four hours. Good job everyone. Following the planting, the Ambassador of Italy to the US - Giovanni Castellaneta - hosted volunteers to a reception on the Italian Embassy grounds as a thank you. Councilman Michael Brown and Andrew Huff, representing Mayor Adrian Fenty, also joined in the festivities. I bet you can't say you traveled to Italy just for the day! 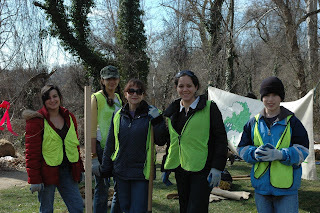 Check out all the photos from the planting on our Facebook Fan Page. Consider joining us for this Friday morning at 8:45 a.m. at the Mt. Vernon Triangle CID as we plant 34 new trees. Yes, I said 34 trees. All are welcome to join us.